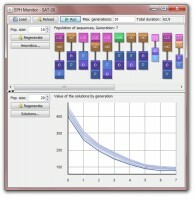 An Evolutionary Programming Hyper-heuristic (EPH) has been proposed for the Cross-Domain Heuristic Search Challenge 2011. The proposed method combines an evolutionary programming approach and co-evolution. The solving process of EPH consists in evolving a population of solutions by applying heuristics sequences. The heuristics sequences are also in a population and evolve according to their performances.